Your child has many milestones to reach over the course of their life. Modern medical science has made it simple for you to track every stage of their development, like when they should be able to lift their head or roll over. Their teeth coming in is a big milestone. It means both you and your child have a new set of responsibilities. 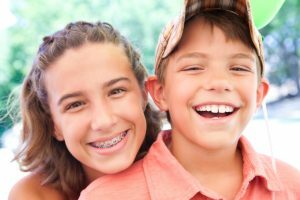 For you, the question is, “When should I take them to see the orthodontist in the South Hills of Pittsburgh?” Should you wait until all of their baby teeth fall out? Should you go as soon as their baby teeth come in? Dr. Gary Cartwright in the South Hills of Pittsburgh has the answers to all of these questions and more. The transition from the baby teeth to the permanent teeth is very important. The location of the baby teeth is a significant indicator of how the adult teeth will come in. The American Association of Orthodontics recommends that you should take your child to see the orthodontist by the time they are 8 years old. They will probably still have most of their baby teeth by this age, but their adult teeth are developing. There is enough development to determine jaw size and shape, if there will be enough space to accommodate all of the permanent teeth, and to observe the upper and lower jaws and teeth in relationship to on another. Your child’s teeth may appear straight, but they could have underlying issues in their adult teeth that you simply can’t see yet. Dr. Cartwright’s exam will allow him to spot subtle signs in developing teeth and jaws that could lead to potential problems in the future. It may be easier to treat certain orthodontic issues before all of the permanent teeth have come in. Keep in mind early evaluation will give you and Dr. Cartwright time and options to help determine what is the best plan of treatment for your child. These conditions can both indicate that they have orthodontic issues or may lead to them in the future. Early intervention is the best way to treat and prevent most orthodontic issues. A quick check up today can help save you and your child from more involved and expensive treatments in the future. Give yourself peace of mind while giving your child a straight smile. Make an appointment with your South Pittsburgh Orthodontist today.